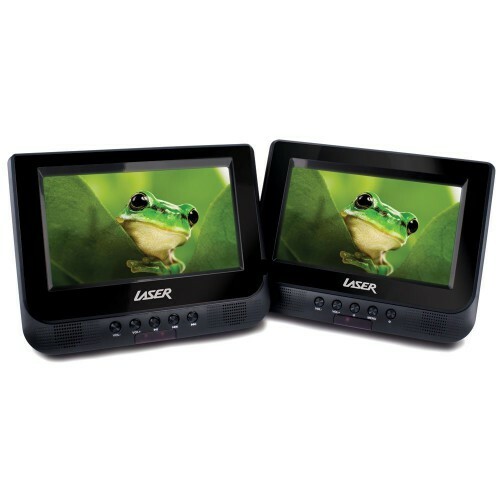 Keep the kids entertained with this twin 7" LCD rear seat entertainment system. Powered by your car's 12V socket, you can playback movies or music from the in-built DVD player, via the USB socket or SD card slot. The master (drive) unit can read a variety of formats including DIV X, AVi and MP3/4 and is equipped with a high quality Hitachi optical laser pickup with electronic anti skip memory - for those extra bumpy roads. Bundled with this kit are the headrest attachments and over-head earphones for comfortable listening. Purchase any LASER DVD player and receive a 6 week trial of free unlimited movie rentals with Quickflix, worth $39.95.